Years and years ago one of my best friends was working her way through grad school. She worked for a company that made breakfast cookies. At first I thought the idea sounded ridiculous but then after trying an assortment of them and learning that they were not just sugar cookies that you eat for breakfast but flavorful, nutritious, high fiber, no added sugar, well balanced cookies, I was quickly sold. That was until I realized that they were not sold where I lived nor were they Gluten Free for the husband. Mix all dry or semi dry ingredients together. In another bowl, or if you are lucky enough to have a Blendtec, add all wet ingredients and mix well. Note: if you are not yet comfortable with coconut oil, canola oil will work, or if you want to go extra healthy use applesauce. 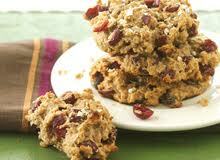 You can also make these with out the egg if you are trying to go dairy free. They cook up just fine and are a little more crumbly but I myself like the added protein. Combine the wet and dry ingredients. Then shape with a cookie scoop or spoon. Mixture will be loose so press the tops down slightly. Bake @350 degrees for 20 minutes. I always find that baking my cookies on parchment papers really does make a difference for the better but if you don't have parchment then just go without. Enjoy! Wahoo! I can't wait to try these, especially pumpkin! If you decide to make these by the hundreds, I will work for cookies. I'm the speediest at peeling them off the parchment paper to stack them for wrapping. Yum. Delicious! I just posted about this recipe on my blog. In Health!